If you live somewhere where summers are hot and dry, you can instantly tell which homes don’t have automatic sprinklers installed. Or they may have them installed, but like the blinking “12:00” on that VCR of yore, the owners may not have mastered the art of programming the controller. To be fair, the UI on most residential irrigation controllers is a bit wanting, which is the rationale behind letting Google Calendar tell your sprinklers when it’s time to water. Granted, someone who is mystified by setting a digital clock is not likely to pull off [ClemRz]’s build. It’s still pretty simple stuff, though, centered around an ESP8266 as it is. And calling the result an “irrigation system” is a little bit of a stretch, given that it could only support a single zone with a solenoid valve harvested from a defunct sprinkler timer. But as a proof-of-concept, or to water a small area, it hits all the marks. The ESP8266 drives the latching solenoid valve through an H-bridge chip after reading your Google Calendar and looking for upcoming events to open or close the valve. The Google Script and the ESP8266 code default to failsafe so that a mistake doesn’t leave the valve open and run up your water bill or drain your well. It’s easy to see how this can be expanded to control a multi-zone irrigation system and support a smartphone UI for instant control of the valves. Overrides based on weather forecasts would be a nice feature too. Or you could just read the soil moisture levels directly with backscatter sensors. [Pete], a musician, and the guy behind SparkFun’s pogobeds and locking footprints has a sprinkler hack. He wanted to keep his dog, Choppy, happy with a green lawn while also keeping his sidewalk water free. To solve this problem, he hacked his sprinkler and hose to adjust the sprinkler’s range. 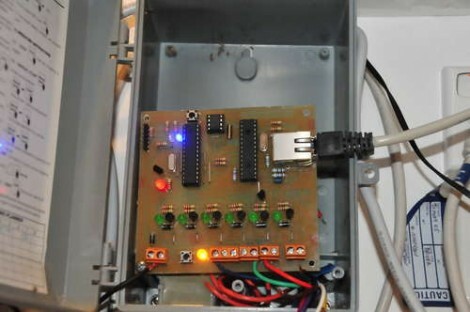 He uses an Arduino to read a potentiometer signifying the direction that the sprinkler is facing and a servo to adjust a hose valve that controls the sprinkler’s water flow. Be sure to check out the video above to see it in action.